Although the idea may seem unsettling to some, in recent years, human urine has been shown to be equally as effective as conventional fertilizers. Methods are now being employed to separate and collect urine from other wastewater, so that it might be used for farming and agriculture. 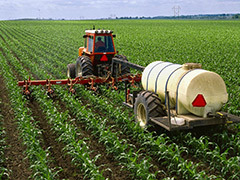 It is commonly known that urine makes an effective fertilizer due to the fact that it is rich in nitrogen and phosphorous. In fact, wastewater treatment facilities go through great pains to rid wastewater of these two nutrients before reintroducing the water into the environment. The World Health Organization has found that, while urine only makes up about 1 percent of all the wastewater gathered by treatment facilities, it accounts for 80 percent of the nitrogen and 55 percent of the phosphorous running through those facilities. For this reason, separating urine before it ever enters these wastewater supplies would greatly reduce the cost and energy needed to remove those nutrients later. And this is exactly what several progressive organizations have started to do. In Amsterdam, a company called Waternet held a demonstration in which men used public urinals to gather urine that later fertilized a rooftop garden. Also, Sustainable Organic Integrated Livelihoods, or SOIL, is a group that has installed numerous toilets in Haiti, a country that is severely lacking in sanitation. These toilets separate human waste in order to collect it, compost it, and later apply it for use in fertilizers. Here in the U.S., the Rich Earth Institute employs similar, but more basic methods. The institute has received funding and grants from the USDA and EPA for their work in finding alternate solutions for farmers who cannot afford commercial fertilizers. In 2013, they received over 3,000 gallons of urine donations, and they expect that number to nearly double this year. Urine separation and collection provides an eco-friendly alternative for fertilizer while also saving on cost and energy for water treatment facilities. People would do well to rethink their notions of “waste” and begin to more readily embrace these methods for the good of the environment. Is a World Food Crisis Inevitable? What are possible solutions to the Greenhouse effect? Posted on March 5th under Global Ecology.